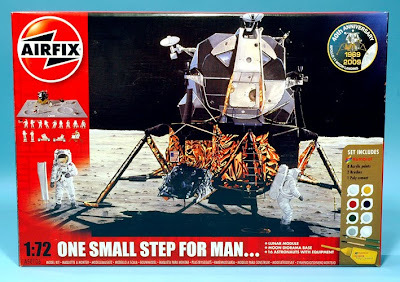 When asked by Airfix if I would take a look at two potential reissues to celebrate the Apollo 11 40th anniversary, I knew there were some changes that were going to have to be made. First, the Saturn V had to have its Service Module corrected, which was done, and which I covered in a previous posting. 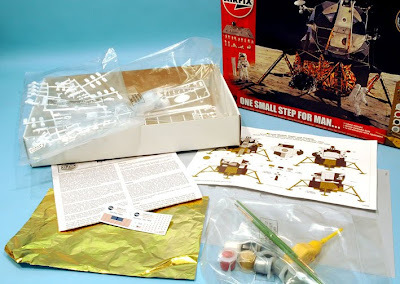 Second, the 1:72 scale Lunar Module (LM) needed looking at. You can be picky and say some details on the Airfix LM are not quite right, but overall it is actually pretty accurate. However, one aspect needing a change was the supplied colour scheme. When the Lunar Module was first announced (originally it was called the ‘Lunar Excursion Module’, but NASA reputedly dropped the ‘Excursion’ as it sounded a bit like a vacation, though the pronunciation ‘lem’ remained) it was usually seen in a black and white finish. However, this was only for early non-final ‘boilerplate’ versions, but the colour scheme got through to the early Airfix artwork and this has never been changed, until now. So my main task was to ensure that the new colour instructions were closer to the actual scheme of the flightworthy LM, given the limitation that this is a kit aimed at the general model-maker. With designer Jonathan Mock doing excellent graphics and a new decal sheet, you now have a colour plan that uses black, gold, aluminium and silver - and if these aren't absolutely every single shade seen on the real craft, they're much closer than plain ‘black and white’. And that’s not all with this new Airfix kit. 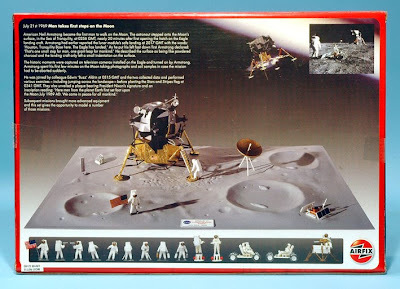 You also get the Astronaut Set included, which conveniently provides two Lunar Rovers (for Apollo 15 through 17) and other astronauts in alternative poses. The only brand-new part is an extra vacuumed-formed base that can incorporate not only the LM, but as many astronauts and equipment as you like. It's a good size, measuring some 347 x 246 mm (13.6 x 9.7 in). A last-minute decision by Airfix was to include a sheet of gold foil, to cover appropriate areas on the LM Descent Stage. The pictures show the new box-art (top), another first for this kit, which has always used a variation of the original painting. The back (middle) has neat renderings of what’s in the box, including the astronauts, which were rapidly built by me! The box contents (bottom) include a separately packed LM and its two astronaut figures, all moulded in polystyrene. The astronauts are polyethylene, a material that does not take enamel paint or conventional plastic cement, but you can use superglue and acrylic paints. As Airfix designates the kit as a ‘set’, eight small pots of acrylic paints are supplied, along with paint brushes and cement. And finally - if you want to add more detail, the plans include the address for Mike Mackowski’s excellent Space in Miniature website. His book SIM 7 Apollo Lunar Module is packed with information. Visit Space in Miniature here.